This wonderful wine region and tourist Mecca is subject to influences from Port Philip Bay, Western Port Bay and Bass Straight. The climate is cool, with one of the strongest maritime (coastal water) influences in Australia. Temperatures and terrain gradually change with the aspect and altitude. The coolest sub region is Red Hill. Warmer temperatures and sandier soils are found at Moorooduc, and Main Ridge receives the highest rainfall. A discovery tour exploring the hidden charms of the Peninsula is a must do on any worthy bucket list! With regard to wine – the region boasts world class and distinctive Chardonnay and Pinot Noir. Various wineries are also proud to highlight their sparkling wine, sauvignon blanc, pinot g’s, rose’s, cool climate shiraz, and many other varieties. Due to the vision of Kathleen and Kevin Quealy, the Mornington Peninsula was the first region to introduce Pinot Gris grape vines into Australia. A wonderful tasting at the intimate ‘Quealy Cellar Door’, which boasts an eclectic range of Gris/Grigio, and other individual wine styles, can be included in the itinerary – highly recommended. Montalto – Hugely popular cellar door, restaurant and pizzeria. Award winning wines. A wonderful family friendly sculpture park invites a leisurely walk down to the lake : with a glass of wine in hand of course! Picnic opportunities are very popular. A fabulous outdoor veggie and herb garden adjoining the outdoor eating area is free to be admired; the wonderful produce is used in the kitchen. Quealy Winemakers – A lovely personal touch is the hallmark of the experience here. Lovely wines, great food platters, atmospheric tastings in the barrel room can be discussed. Point Leo Estate – I f you like a splash of glitz and glamour – look no further. Highly rated dining experiences among, unsurpassable bay views. Multi million dollar art instillations in the sculpture park. Most important of all – friendly and knowledgeable cellar door staff – delivering a memorable tasting experience. Red Hill Estate – One of the most visited wineries on the Peninsula. This large and busy cellar door is easily able to accommodate larger groups. Estate and single vineyard wines are available for tasting. The site also features Max’s Restaurant – with stunning views of Western Port Bay. 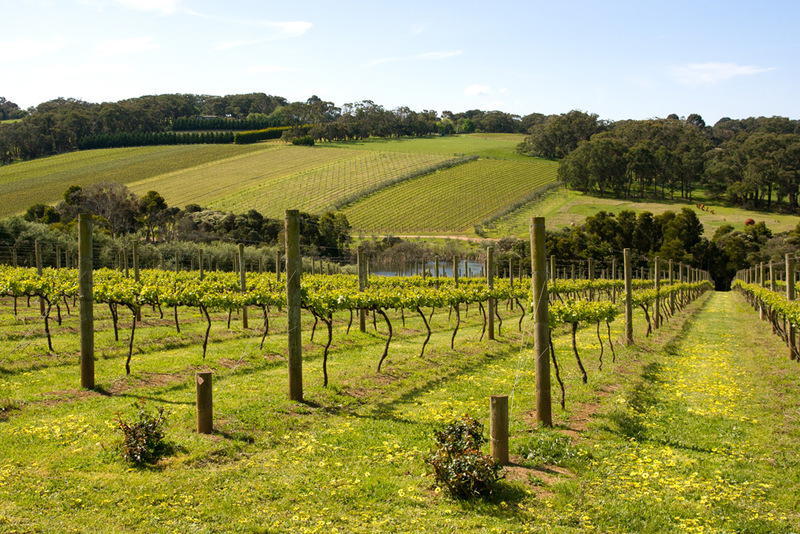 Yabby Lake – The vineyard is located on a north facing slope, thus utilizing maximum sunlight. Sea breezes help to keep the vines cool. The arrival of the highly regarded Tom Carson as senior winemaker (previously at Yering Station in the Yarra Valley), helped to lift the standard and profile of the wines. Currently Yabby lake is one of the most highly regarded wineries in Austalia, having won the prestigious jimmy Watson Trophy for it’s Pinot Noir in 2014, the first time a Pinot Noir had been awarded the coveted prize. A great array of stunning single vineyard Pinot Noir and Chardonnay, as well as the great value’ Red Claw’ range, make Yabby Lake an unforgettable destination for the wine lover. Casual dining at the cellar door overlooking the vineyard is a possibility worth considering.